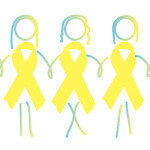 Synarel is a medicine in the form of a nasal spray that is used to treat endometriosis. It is very important that it is taken at the same time every day and it is used properly. 1. Think about a way to remember to take your Synarel medicine- Example: Set your cell phone alarm. 2. Keep track of each dose of Synarel that you take. Ex. Using a calendar or checklist. 3. Use the bottle of Synarel for up to 30 days then open up a new bottle. If your health care provider or gynecologist increases your dose, you will likely run out of medicine before 30 days are up. 4. Prime the bottle of Synarel (before you use it for the first time). c. Hold the bottle straight so that the nozzle is on top. d. Put two fingers (index and middle fingers) on the side of the nozzle (see photo). Your thumb should rest on the bottom of the bottle. e. Press down evenly and firmly with your index and middle fingers. Do this 7-10 times until you see a fine mist. f. Stop when you see the fine mist. The medicine/pump is now “primed”. g. You only need to prime the bottle when you open it for the first time. 5. After you prime the bottle, you’ll need to: Clean the spray tip. 6. Hold the bottle side-ways and run it under warm water for about 15 seconds. Use a clean paper towel or clean cloth to dry the tip. 7. 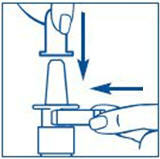 Place the white safety clip back on the neck of the bottle and cover the nozzle tip with the cap. 8. Never poke anything into the spray tip or take it apart. 1. Gently blow your nose before you use Synarel. 2. Remove and save the safety clip from the neck of the bottle. 3. Clean the spray tip by holding the bottle sideways. Rinse the tip under warm water for 15 seconds. Dry the tip with a clean cloth or paper towel. 4. 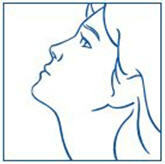 Bend your head forward and place the tip of the bottle in your nostril. The tip should feel comfortable. 5. 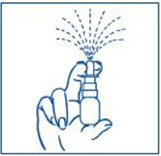 Aim the spray towards the back and outer side of your nostril. 6. 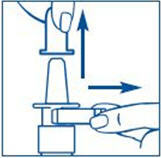 With your other hand, place one finger on the opposite nostril and push it until the nostril closes. 7. Using even pressure, squeeze down on the sides of the nozzle/spray (pumping the spray 1 time) while you gently sniff in the mist. 8. 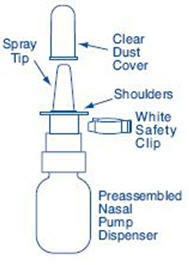 Take the nozzle/spray tip out of your nostril and gently tilt your head back for a couple of seconds to allow the medicine to reach the back of your nose. 9. 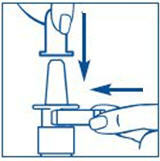 Clean and dry the medicine tip and replace the cap and the safety tip. 10. Store your medicine upright, away from direct light. Keep your medicine in a safe place away from young children and pets. NEVER store Synarel in the refrigerator or freezer.